This organ is a remarkable survival, since so many of Samuel Renn’s organs has been wholly or partially destroyed, much of it in recent years. An account of his work can be read in Michael Sayer’s Samuel Renn, English Organ Builder (London 1974) and Industrialized Organ-Building – a Pioneer (in Organ Yearbook vol VII 1976). This organ was restored by Alexander Young in 1886 (who expanded the Pedal organ and reduced the manual compass), and again by Jardines in 1918 and 1959. We restored it in 2004. The organ was made for a gallery against the chancel arch, facing westwards, but was soon moved to a position facing across the chancel, in the north aisle. It is made in Renn’s highly standardised manner, adapted to suit the customer and local conditions. Despite space originally provided on the chest and the stop jamb, there seems never to have been a Great Trumpet, till now. The new Trumpet is based on Renn examples at St Philip Salford and The GG manual compasses have been restored, the wind chests dismantled and restored, the bellows re-leathered and the wind system made wind-tight. The manual key compass is GG AA – f³. The pedal would originally have been GG – c°, with unison open pipes, but Young’s Pedal of 1886 has been kept, C – e¹ with a Bourdon. 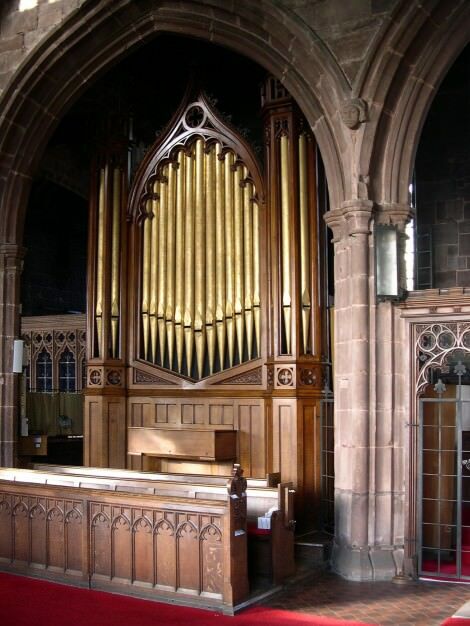 The Swell has a chest starting at c°, and the keys GG – B operate a Choir Bass playing the Pedal Bourdon (following the organ Renn made for the Chester Festival of 1829). The Great Stop Diapason bass is GG – B, the treble c° – f³. The Great Sesquialtera is GG – b°, Cornet c¹ – f³. The pitch had been altered to A440, with tuning slides, which has been retained. The swell has a hitch down pedal, and a box with Venetian swell shutters and straw-filled hessian panels covering the inside surfaces. The project profited from the guidance of Jim Berrow as consultant and Norman Baker as organist.